Despite the South Korean government’s ambitious plans to create a hydrogen economy this year, oil refiners appear to be taking a passive stance, citing questions over profitability. In January, the government announced its road map to boost the hydrogen economy, produce 6.2 million fuel cell vehicles by 2040 and eventually become the largest hydrogen car producer in the world. The government said 50,000 tons of byproduct hydrogen are currently available to fuel 250,000 hydrogen cars. Byproduct hydrogen is made in the process of refining oil and making petrochemicals and steel. In Korea, four major oil refining companies -- S-Oil, GS Caltex, Hyundai Oilbank and SK Innovation -- produce hydrogen byproducts through oil refining and petrochemical facilities in which they recently invested. But some industry insiders say hydrogen byproducts from the oil refiners may not be enough to use for fueling hydrogen cars because the firms began to diversify their business into non-oil refining businesses, such as rechargeable batteries. The government said the estimate of 50,000 tons was made based on the past industry data but it can be changed based on demand and supply. 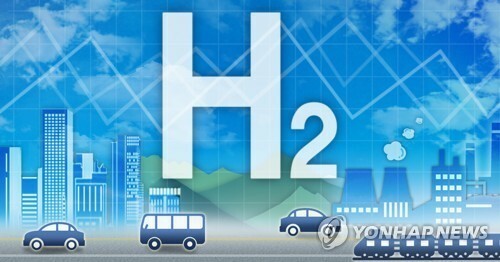 Kim Pyung-joong, an executive of the Korea Petrochemical Industry Association, said hydrogen byproducts could satisfy the government’s needs in the short term, but things may change in the future, as it is still “not generous” because byproducts are not something that can be produced arbitrarily. Last week, Hyundai Motor announced it would invest 8 trillion won to build 500,000 hydrogen cars by 2030. Charging stations are also another obstacle. Despite the world’s first title, Korea is still behind in the distribution of fuel-cell cars due to the lack of infrastructure for producing, storing and charging fuel cells. As of October 2018, 5,715 cars were sold in the US, 3,359 cars were distributed in Japan, 926 cars in Europe and 794 cars in Korea. There are currently only nine stations nationwide, with only two in Seoul, though the government aims to produce 4,000 hydrogen cars this year. This is compared to Japan, which is a rival in hydrogen. It has more than 100 charging stations. Oil refining companies are hesitant to jump into the hydrogen station business due to uncertainties and high operating costs. To create hydrogen-filling stations, there needs to be tanks to store hydrogen and reforming facilities to produce hydrogen and large sites. Running hydrogen tanks also generates high power costs. “Because oil-refining companies do not produce hydrogen, they first have to find the hydrogen supplier and then they also need to find large site to have tanks in cities where this is hard to find. It is not easy to jump into the business because profit is not guaranteed,” said an oil-refining insider.